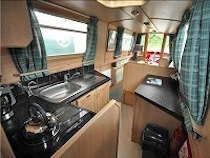 Design : The Alvechurch Wren is a 47ft long, 4 berth semi-traditional stern narrowboat. It has a quiet water-cooled diesel engine with simple to use controls. 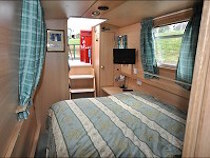 Berths : As this is a 4 berth boat, there is a choice of extendable fixed double or two singles in the rear cabin, all of which have interior sprung mattresses. An optional dinette/double is available in the saloon. TV in each cabin. Bathroom : The bathroom comes complete with a wash hand basin, electronically operated flush toilet, and shower. A 240v shaver socket is also available. 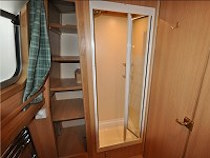 There is also a large mirror in the bathroom, and a bi-fold shower door. Additional Information: Tuition, and buoyancy aids, are supplied free of charge. Front deck table. A safe is supplied on the boat (except on boats based at Gailey), as are helmsman's waterproofs and an umbrella.